Emma is not a lap cat but she is affectionate. When you live in the land of the Snuggle Twins and the 70 lb. lap dog, however, finding that affection isn’t so easy. Emma has solved this dilemma by waiting for me to play with Ellie and then running up tight beside me to be petted with one hand while I play with Ellie with the other. But one day I noticed her on a ledge near the bathroom after I took a shower and took a few minutes to let her play in my wet hair. Since then she’s became a regular customer and is often there to greet me when I step out of the shower. Eventually I set her on the bed and laid down and patted my chest and to my surprise, she jumped right up and started rubbing her head against mine and chirping her birdie purrs. Our one-on-one snuggles have now become a morning ritual, although they don’t always last for long, one of the others will usually sniff out that snuggling is afoot and jump up with us. 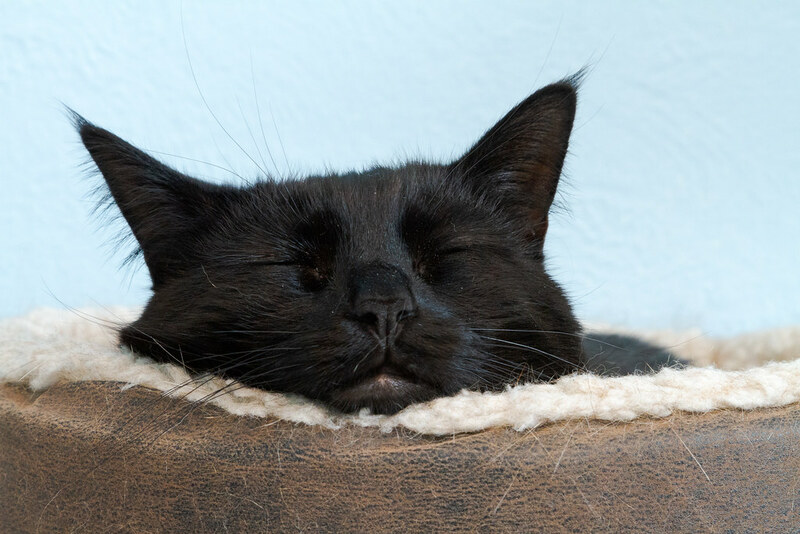 This entry was posted in Pets and tagged black cat, cat, cat bed, Emma, sleeping. Bookmark the permalink. ← Keep Arms and Legs Inside the Ride At All Times!